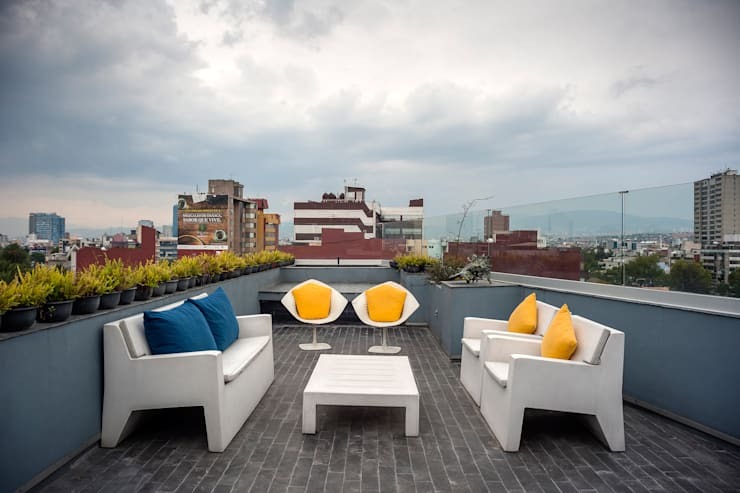 You may think that the decoration and the furniture you choose for your patio or terrace is something that matters the most. But there is another thing which is essential for showing the image that you want to convey. We are talking about the ideal floor for your outdoor space. 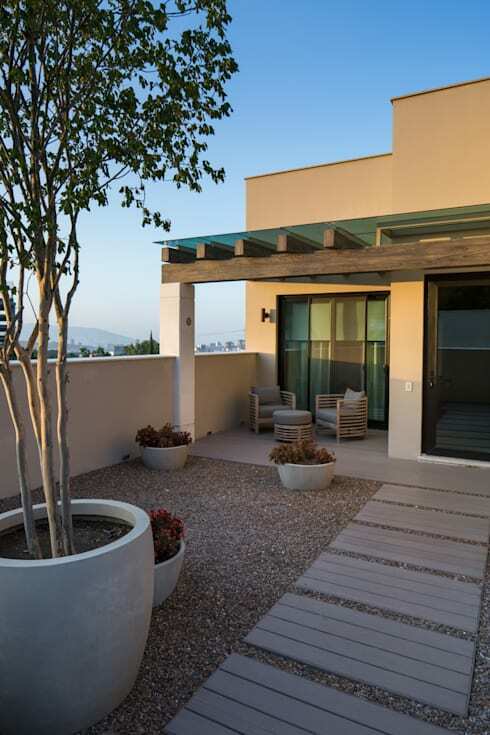 On Homify, you will be able to find many options regarding the right patio or terrace flooring. With this ideabook, we want to show you 11 of the most practical examples. They will surely make you rethink whether or not you have the right one in your home. 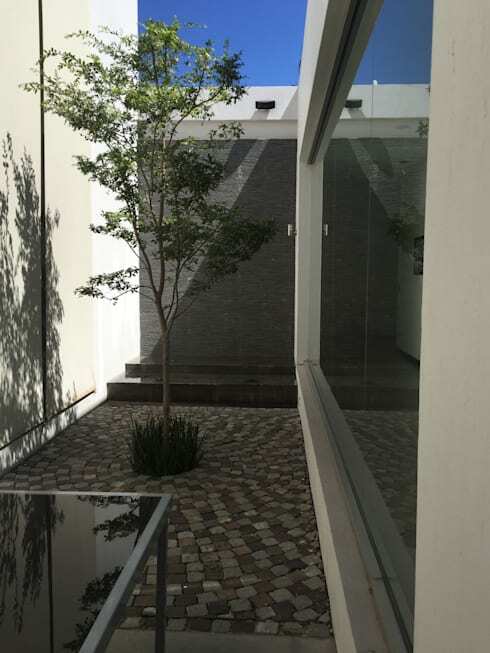 Before changing the outdoor flooring for terraces or patios, you must be aware of the wide variety of materials that exist. Also, you need to consider the ones that would be the most appropriate for your home style or your taste. They should also be well within your budget. 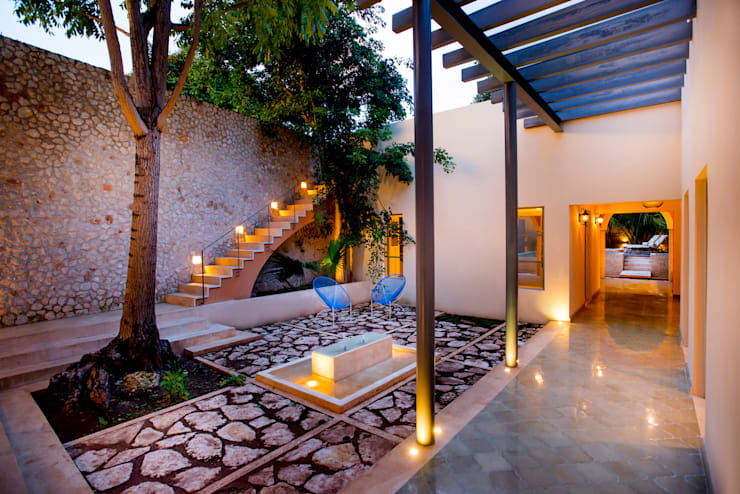 These materials include everything from wood, natural stone, artificial stone, to ceramic tile. The first thing that you have to do is measure the floor area and get an idea of the budget you want to spend. All materials do not have the same price, which makes this tip all the more critical. The cost of these elements are usually shown in per square meter, so checking the bill is simple. Find out about the cheapest and most expensive materials in your area to choose the ideal one. The ceramic tile is not an expensive material. It is also very comfortable and functional, especially if you choose the one with an anti-slip finish. Also, remember not to select a light colour like white for an outdoor area. Bright colours can reflect too much, and it becomes uncomfortable for the view. Clay tiles provide a rustic finish and are a favorable alternative for exterior areas. In addition, you can also find various sizes according to your preferences. These includes 24cm x 12cm x1.5 cm and its weight is 0.80kg. By using these tiles, a single square meter can be covered with 32 pieces. The other option is of 30cm x 30cm x 1.5cm that weighs 2.5kg. Here 11 pieces will be able to cover 1 square meter. Natural stone slabs can be the most welcoming and beautiful alternatives you can use for your patio. Also, you will find them in different sizes, shapes, and even colours. This allows you to choose the one you like and even combine several of them effortlessly. It is a material that weighs a lot, so you'll need someone to help you transport and place the slabs. 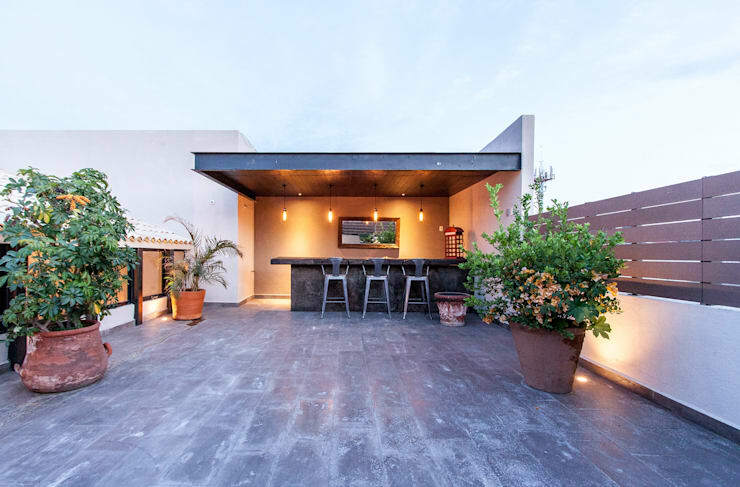 This is an alternative that you can combine with the previous outdoor terrace flooring example. 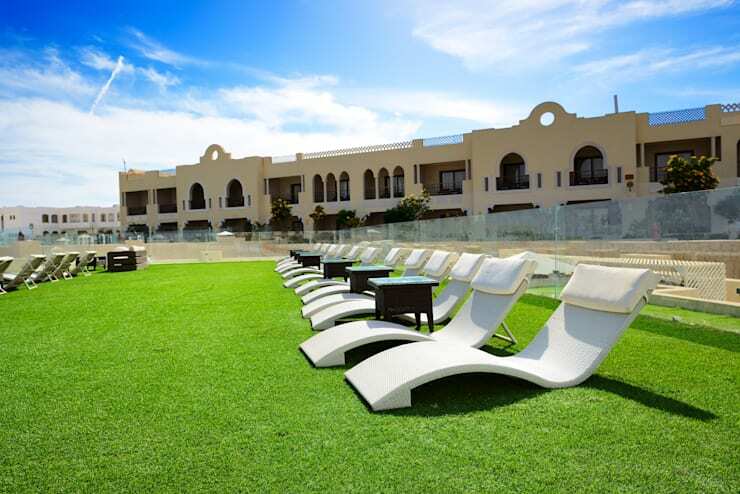 Here you can place slabs of natural stones but with joints of natural grass. 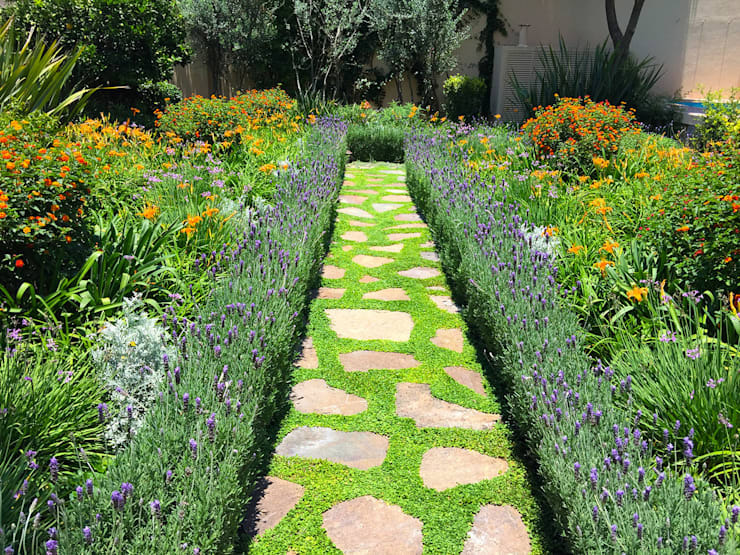 You can make a path as decorative as this, and even cover the whole floor in this way. The main difference between gravel and sand is that the latter is smaller than the first. It is an effortless way to give a new life to your floor, and it hardly requires any maintenance. If you find it uncomfortable to walk, you can choose to add a few wooden slats like seen in the picture. Marble stone in 20kg bags. It is 3.5 inches and covers 0.25m². Whereas, gravel covers 1 square meter. Sea stone is achieved in sacks of 20kg depending on the size of the stone. It covers between 0.50 to 0.75 square meters. River stones are sold in 60kg bags. The 3.5 inches tile covers 0.50sqm. The 1.5 inches ones cover 1.4 square meters, and the 1/2 inches slab covers 1.5 square meters. 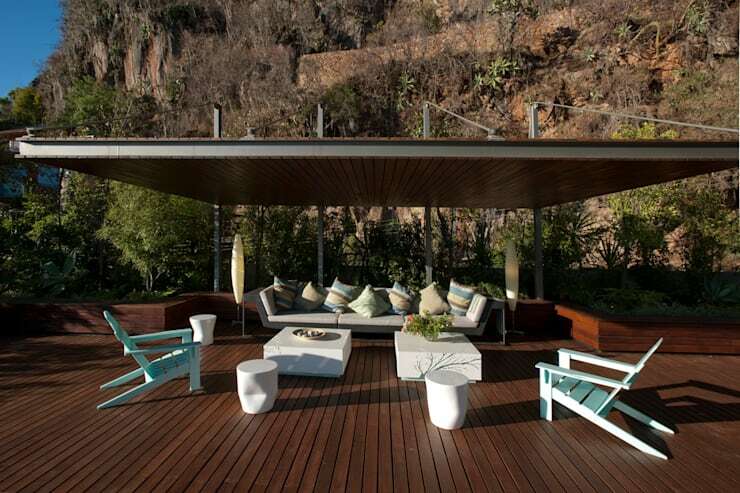 Wood is a fantastic material both for interior and exterior areas. 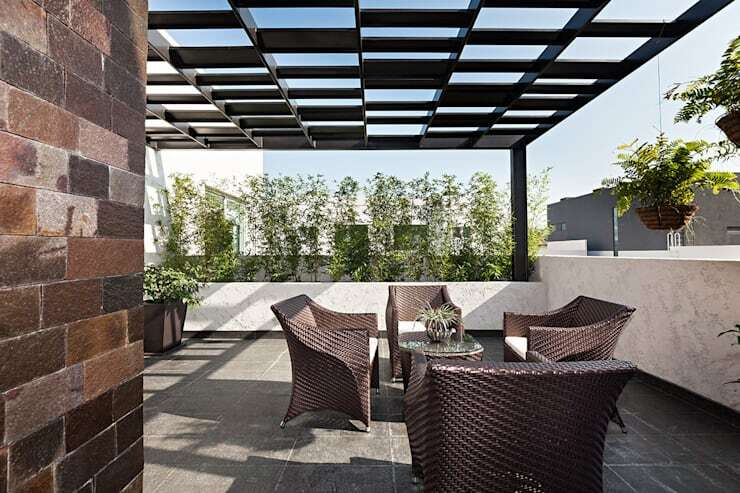 Do not worry about such terrace or patio flooring, since it can also withstand the inclement weather. Of course, it is a material that requires more care and attention than others. But its beauty and charm make it worth the effort. 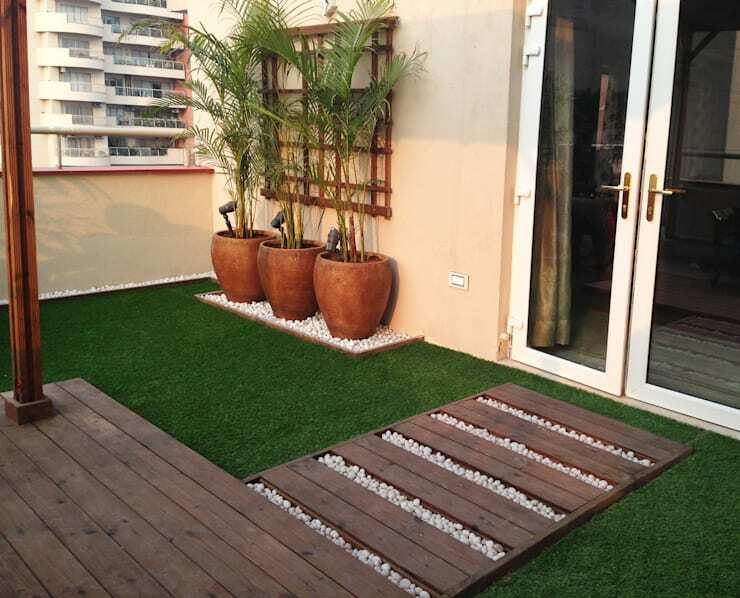 Artificial grass is a good alternative when we are looking for naturalness and greenery. It also reduces the pain of maintaining natural grass. It is an excellent choice for both a whole garden and a single part. Finally, we close this ideabook with the combination of different materials in the same space. The truth is that the game of colours and textures is the most favorable for any area.